UFC 154, which took place this past Saturday, was a historic event that featured the return of Georges St. Pierre, the long reigning UFC Welterweight Champion. The Main Event featured St. Pierre, who had been out for 19 months; successfully defending his title against Carlos Condit in a fight of the night performance. The fight was the usual dominating performance on the score cards for GSP, as he won a unanimous decision with scores of 49-46, 50-45, and 50-45. The only problem with those score cards is that they don’t tell the whole story of what went down on Saturday night. In the third round, Condit drilled GSP with a beautifully timed left head kick, dropping the champ in the process. GSP fans everywhere held their collective breaths as it appeared as though Condit was closing in on a shocking upset. That, of course was not to be, as GSP would survive that round, and ultimately take home the decision. For the first time, in a long time, GSP looked like he had been in a fight. 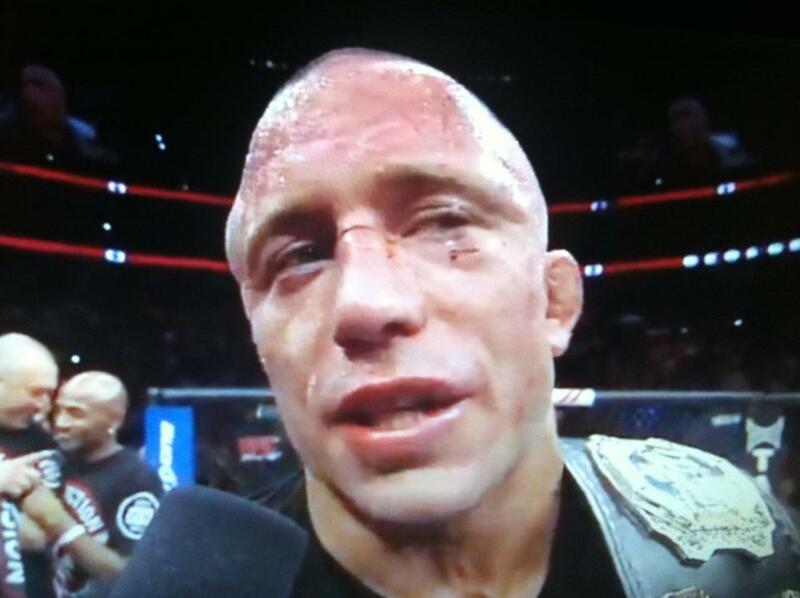 His face was swollen and bloodied up, and I think it is safe to say that this was GSP’s toughest opponent to date. I realized that GSP has lost before, but those were relatively quick finishes, whereas this fight was a tough fight from beginning to end. Watch the highlight of the kick that almost won the night for Condit in the video below. Video courtesy of the UFC. The Co Main Event lasted all of 46 seconds as Johny Hendricks blasted Martin Kampmann with a huge left hook, ending the fight in brutal fashion. With the win, Hendricks should be named the #1 contender for the Welterweight Championship. In another featured fight, Francis Carmont was given a gift decision, as he was awarded a split decision over Tom Lawlor. In other action, Rafael Dos Anjos looked phenomenal in methodically picking apart Mark Bocek. Dos Anjos won a very dominant unanimous decision. The opening fight of the pay per view featured Pablo Garza winning a unanimous decision against Mark Hominick; dropping the former title challenger to 0-4 in his last four fights. I can keep talking non sense, but the purpose of this article is to create match-ups that everyone would want to see. So without further ado, I give you, Fighters Rendezvous: UFC 154 Main Card Edition.